Spring is on the way. First snowdrops are in the garden. For years I have only had one lonely snowdrop which never seemed to want to clump and spread as they are supposed to do. I planted more bulbs last fall and was happy to see a new patch coming up near the steps. 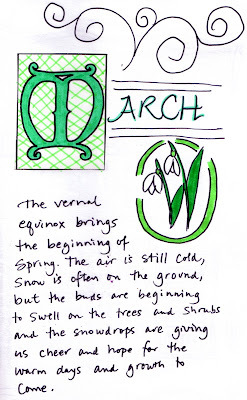 The image is a page from the Book of Hours I made for one of the projects in Handmade Books For A Healthy Planet. There will be an online supplement to the book which will have videos, links, and patterns like letter outlines to illuminate for the Book of Hours. Being a spring person, born on the 21st, I treasure spring each year.